The controlled precipitation of strontium fluoroapatite crystals was studied in four base glass compositions derived from the SiO2–Al2O3–Y2O3–SrO–Na2O–K2O/Rb2O/Cs2O–P2O5–F system. The crystal phase formation of these glasses and the main properties of the glass-ceramics, such as thermal and optical properties and radiopacity were compared with a fifth, a reference glass-ceramic. The reference glass-ceramic was characterized as Ca-fluoroapatite glass-ceramic. The four strontium fluoroapatite glass-ceramics showed the following crystal phases: (a) Sr5(PO4)3F – leucite, KAlSi2O6, (b) Sr5(PO4)3F – leucite, KAlSi2O6, and nano-sized NaSrPO4, (c) Sr5(PO4)3F – pollucite, CsAlSi2O6, and nano-sized NaSrPO4, and (d) Sr5(PO4)3F – Rb-leucite, RbAlSi2O6, and nano-sized NaSrPO4. The proof of crystal phase formation was possible by X-ray diffraction. The microstructures, which were studied using scanning electron microscopy, demonstrated a uniform distribution of the crystals in the glass matrix. The Sr-fluoroapatites were precipitated based on an internal crystallization process, and the crystals demonstrated a needle-like morphology. The study of the crystal growth of needle-like Sr-fluoroapatites gave a clear evidence of an Ostwald ripening mechanism. The formation of leucite, pollucite, and Rb-leucite was based on a surface crystallization mechanism. Therefore, a twofold crystallization mechanism was successfully applied to develop these types of glass-ceramics. The main focus of this study was the controlled development of glass-ceramics exhibiting high radiopacity in comparison to the reference glass-ceramic. This goal could be achieved with all four glass-ceramics with the preferred development of the Sr-fluoroapatite – pollucite-type glass-ceramic. In addition to this main development, it was possible to control the thermal properties. Especially the Rb-leucite containing glass-ceramic showed the highest coefficient of thermal expansion (CTE). These glass-ceramics allow optical properties, especially the translucency and color, to be tailored to the needs of biomaterials for dental applications. The authors conclude that it is possible to use twofold crystallization processes to develop glass-ceramic biomaterials featuring different properties, such as specific radiopacity values, CTEs, and optical characteristics. Heat treatment of an MgO-CaO-SiO2-P2O5 glass gave a glass ceramic containing crystalline apatite (Ca10(PO4)6O,F2] and beta-wollastonite (CaO,SiO2) in an MgO-CaO-SiO2 glassy matrix. It showed bioactivity and a fairly high mechanical strength which decreased only slowly, even under load-bearing conditions in the body. It is used clinically as artificial vertebrae, iliac bones, etc. The bioactivity of this glass ceramic was attributed to apatite formation on its surface in the body. Dissolution of calcium and silicate ions from the glass ceramic was considered to play an important role in forming the surface apatite layer. It was shown that some new kinds of bioactive materials can be developed from CaO,SiO2-based glasses. 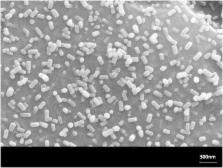 Ceramics, metals and organic polymers coated with bone-like apatite were obtained when such materials were placed in the vicinity of a CaO,SiO2-based glass in a simulated body fluid. A bioactive bone cement which was hardened within 4 min and bonded to living bone, forming an apatite, was obtained by mixing a CaO,SiO2-based glass powder with a neutral ammonium phosphate solution. Its compressive strength reached 80 MPa comparable to that of poly(methyl methacrylate) within 3 d. A bioactive and ferromagnetic glass ceramic containing crystalline magnetite (Fe3O4) in a matrix of CaO,SiO2-based glassy and crystalline phases was obtained by a heat treatment of a Fe2O3-CaO.SiO2-B2O3-P2O5 glass. This glass ceramic was shown to be useful as thermoseeds for hyperthermia treatment of cancer. Dedicated to Prof. Dr. Werner Vogel, Jena, Germany, on the occasion of his 90th birthday. Journal ID (publisher-id): Front. Bioeng. Biotechnol. Copyright statement: Copyright © 2015 Höland, Schweiger, Dittmer and Ritzberger. Effect of partial crystallization on the mechanical properties and cytotoxicity of bioactive glass from the 3CaO.P(2)O(5)-SiO(2)-MgO system.